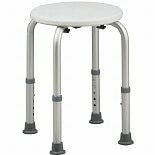 A bath shower stool is an important item for many people, whether they are injured or like a place to sit while they shave. 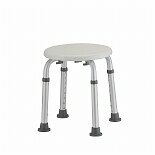 The bath shower stool comes in many various types to better suit your personal needs, whatever they may be. 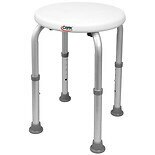 Finding the perfect bath shower stool can revolutionize your shower experience and is easy to do with brands like Drive Medical, Carex, Essential Medical and Nova available to you. Many bath shower stools have four legs, although you can find some with shelving units and some that can be attached to or removed from a bath. Some bathing stools are adjustable for people of different heights or for those who cannot bend well. 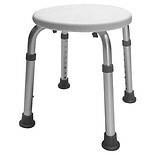 Some stools can swivel to make it easier to reach objects in the shower or bathtub. Bath stools have slip-resistance rubber tips in most cases, so that the chair wont slide around while a person is taking a bath or shower. Shower seats can have a back or come without, making it great to use for those who have trouble supporting themselves. Supportive arms may also help the elderly or injured stay upright during a shower or bath. They can also help when someone has to leave the bath or shower by providing support. 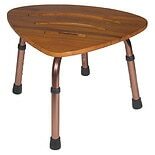 A bath shower stool has many functional uses, from providing stability during shaving to allowing someone to sit while they steam in a sauna. The shelving provided on some shower chairs is perfect for holding soap, shampoo, and other necessary shower and bath items. 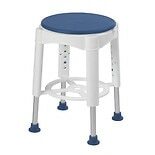 The best thing about a bath shower stool is that it is usually portable, so it can be taken wherever it is needed, whether that is a home, RV, or other location.